The hotel is a stone's throw from the Musée Départemental de l'Arles Antique museum and just a 20-min walk from Arles! For just EUR 1, take the ENVIA shuttle to the old town to visit the city's historic and cultural attractions such as the Arènes amphitheater, Roman theater, Van Gogh Foundation and much more. 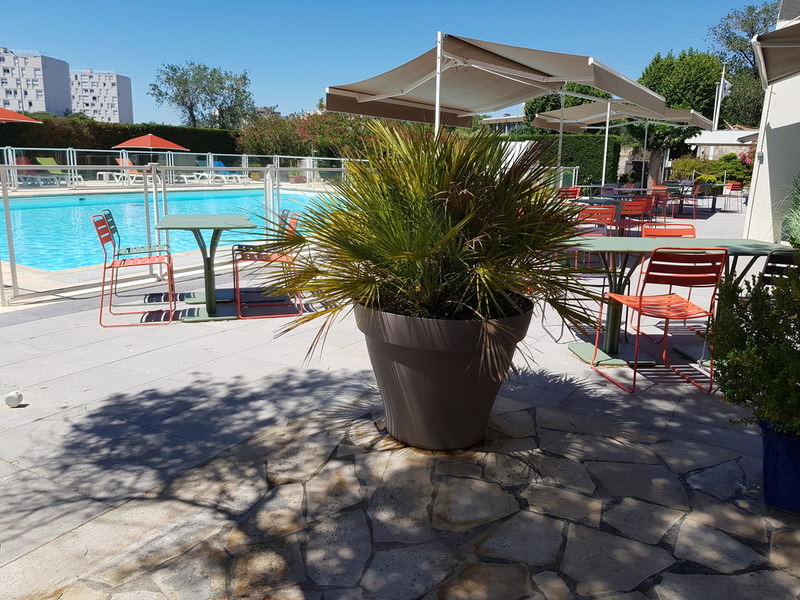 Open 24 hours a day, the ibis budget Arles Palais des Congrès hotel is on the doorstep of the regions of Camargue and Provence. Book today and enjoy affordable prices all year round! Possibly the best Ibis Budget I've stayed in. The hotel is ultra modern and clean as you would expect from Ibis. The staff are amongst the friendliest people I have met. From the room cleaners, receptionists and bar staff. Excellent service. Quiet location and convenient to the outstanding Musée de l'Arles et de la Provence antiques. Within walking distance of the old town. As it is located with an Ibis Styles, a restaurant bar and lounge facilities are available. It is also a hotspot for PressReader. Staff were helpful and friendly. Good basic hotel accommodation - lovely pool area. We were visiting Arles for 4 nights to coincide with the Rice Festival. The hotel was as expected from the Ibis budget range. Good size, clean rooms with basic but good facilities. The shower was great, the pool area was a lovely extra and the buffet breakfast was reasonably priced. The hotel had a large carpark which would have been handy for anyone driving. The short walk into town was fine in distance for us as a couple but wasn't the most scenic walk. We only stayed 3 days, but had a great time. The weather was very hot and the pool was great. The staff were all very friendly & helpful. The hotel was clean and in good condition. It is also not far from the historic centre of Arles, not too far to walk and a very short drive to the car parks on the edge of the old town. Very satisfying. Excellent pool and restaurant and friendly helpful staff. Out of town, the restaurant needed to be good and it was. After a days walking the sites, it was great to have a quality restaurant, though 1 or 2 more choices of dishes would improve it. The pool was large and cooling. All over a very pleasant stay. Room was clean,spacious and comfortable with nice shower. There was good air conditioning. Breakfast was good with fruit,croissants and coffee. There was a nice open air swimming pool. However only problem was by the entrance to the pool some of the paving stones were loose and had smelly water coming out when you came in and out of the pool. It was very unpleasant!This needs to be attended to quickly as it is a health and safety issue. Great location, free parking, kids-friendly environment, professional staff and the swimming pool. Musée de l'Arles antique is near the hotel and it is worth visiting. We enjoyed everything! Good value for that paid price. We are most satisfied with personnel.From the reception to the rest. Room was very clean and quite. Thank you to all. The hotel is located at 15 min on foot from the old city centre. Your car can be left on the hotel parking. Rooms and sanitary clean as can be expected at these hotels. To be recommended for a visit at the city. Although we had suggested we would arrive at about 6pm when we checked in on line we changed our minds and decided to check in before our appointment. The Reception Staff were not at all troubled by this change of plan and our check-in was completed without hitch. We were given all the info we needed for visiting the city centre. Our only minor criticism would be that we found the bedroom temperature a little too warm. We stayed in a family room which was large with clean, comfortable beds. Much quieter than I expected too. The room is spacious and minimal, which is very nice. The location may be a bit outside, but there's free shuttle bus just across the road to get to the city centre, as frequent as 2 times per hour. The swimming pool is another plus; the water is quite cool even under the Provencal hot sun, and it seems not still, but a bit wavy like in the sea, quite a good experience.